Maybe it’s just an East Coast thing, but one of the most exciting things about summertime in the city is the random smattering of thunderstorms that drench you in a split second, and then disappear just as quickly as they arrived! (Perhaps that’s where the term ‘city slicker’ comes from?) Well now you can make a splash with Scandinavian fashion designer Maxjenny Forslund’s colorful, geometric raincoats. 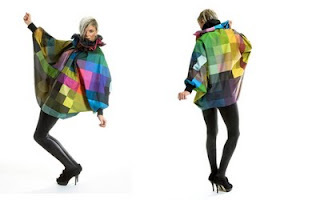 The collection is called Street Sculptures, named after precisely what they are – walking sculptures in the street.hese slick slickers are made from a breathable, crease-free, light and yet waterproof sports-fabric, miraculously fashioned from recycled plastic bottles and colored with water-based paint. 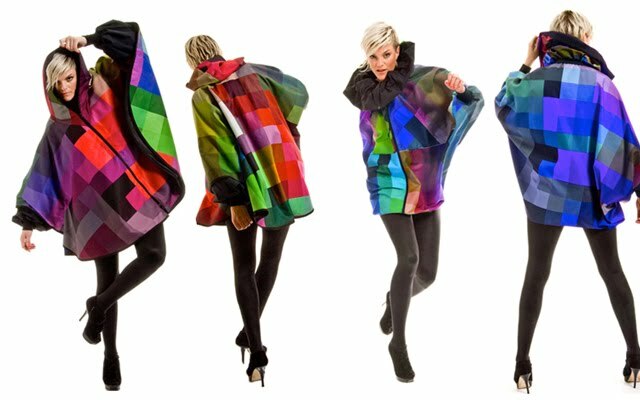 The material of the coat allows you to pack it up tightly into a handbag and extract it at a moment’s notice when the showers hit.